It's whiteout conditions in Kindred, Minnesota, and everyone has headed for home. Now that the Cackleberry Club Café is cleaned up and ready for the next day's business, home is exactly where owner Suzanne Dietz and her two partners Toni and Petra are headed, too... until the sounds of a racing snowmobile and a crash make Suzanne race out the backdoor into the snow. She finds bank president Ben Busacker's decapitated body thrown from his wrecked snowmobile-- and a wire strung tightly between two poles. 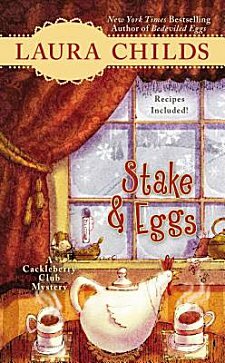 The murder has occurred right in time for the Fire and Ice winter festival, and it chills Suzanne to the bone knowing that she may very well be serving ham and eggs to the murderer in her very own café. The problem is that Busacker was the most hated man in town, foreclosing on well-liked farmers and turning others down for loans. The local sheriff needs all the help he can get in narrowing down the list of suspects, and with everyone beating a path to Suzanne's door, she thinks she's going to be just the woman to pare down that list. This fourth book was my introduction to this mystery series featuring three women in their forties who have banded together in business and in friendship after dealing with the loss of their husbands. Suzanne is the star of the show, and the mastermind behind the café, bookstore and yarn shop. Although everyone in town seems to come to her for help, she's not your usual "Mother Earth" type. If she feels that she-- or anyone else-- is being pushed around, she has no problem with getting in the guilty person's face and telling him what's what. She also has a tendency to shout a bit and share pieces of her mind with everyone when she's on an adrenaline rush-- something that brand-new beau Sam Hazelet can deal with. I sometimes felt a bit out-of-the-loop with Suzanne, her friends, and all the various relationships and histories, so I think that this is a series that might best be started from the beginning. However, the story is well-told, with very plausible red herrings that can easily lead a reader astray, and it's filled with a cast of characters that genuinely care for each other and enjoy each other's company. There's action when it's least expected, and the humor can sneak up and make a person laugh out loud. Yes indeed, it would be very easy for me to become a regular at the Cackleberry Club Café. I didn't read this review, because I'll be reading this one shortly, but I'll be back to compare. I'll keep an eye peeled for your review, Kimberlee! Ohhh ... isn't that cover adorable? I am not familiar with this series yet, though I have enjoyed some of her Tea Shop mysteries, which can only mean one thing - I need to buy a Cackleberry mystery!! It certainly sounds like it, Birgit! Cathy - This sounds like a terrific cast of 'regulars' for a series. And the setup sounds like a great premise too. OK, this one is definitely a series I ought to explore. I hope you like it, Margot! This sounds like a good book/series....great review. Neat that women are the main characters. And these three women are very interesting, Elizabeth. Thanks for stopping by! This sounds really fun and I'm glad to know it's part of a series. I hate coming into a series in the middle of it! I normally don't wander into a series, but I seem to be relaxing my Read From the Beginning Rule. I didn't feel lost at any point; I just felt like I'd missed out on these characters' history, both separately and together.